Tetrahedral concrete forms used to prevent coastal erosion provided the design cues for this soap, which would look at home in any brutalist bathroom. Called Tetra Soap, the product takes its name and shape from tetrapods, the interlocking reinforced-concrete forms used to protect coastlines and sea defences. "Tetra Soap was inspired by tetrapods – architects' favourite concrete water breakers," said Mike Mak of Tetra Soap, the Hong Kong brand behind the product, which started out as a crowdfunded project on Kickstarter. The grey soap has a texture that mimics the surface of raw concrete and the brand claims the four-pronged design prevents it slipping out of your hands while washing. 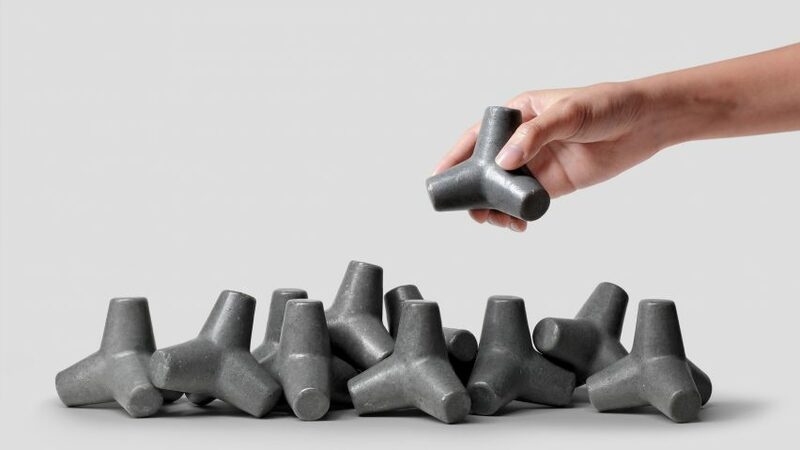 "Tetra Soap draws inspiration from not only the shapes of tetrapods but also the technique of production through casting, along with their concrete colour and texture," the brand said. The designers believe that the shape of the soap makes it much harder to drop than a traditional bar. The Tetra Soap's form with four pivot points also helps it dissolve slower. "Soap is a product for cleaning made from an oil-based material," explained the brand. "When it meets water, it dissolves and becomes slippery. The shape of a normal soap is streamed-line and becomes hard to hold by hand." It is made from Italian extra virgin olive oil, coconut oil, essential oils and distilled water that is individually cast in a silicone mould. "Slow-made using a cold process production method, each handmade soap is individually cast in a unique Tetrapod-shaped mould which makes it 100 per cent slip free," the brand said. "Mild, natural and suitable for all skin types, the soap won't strip your skin of needed natural oils or disrupt its pH balance." Tetrapods were designed in 1950 by French engineers Pierre Danel and Paul Anglès d'Auriac, who patented their invention. The name derives from the ancient Greek words tetra, which means four, and pode, which means foot. Other designers have also been creating concrete-inspired products. Earlier this year, Kia Utzon-Frank designed a series of sweets inspired by the Barbican's Brutalist-style architecture, while in 2016 he created a set of sculptural cakes that look like blocks of solid polished stone.